Can’t make the trip to New York to look for inspiration? Many of its design shops sell online and ship to Canada, like CB2. OTTAWA — I spent last weekend in New York and it really got me thinking about how to live vertically. Everywhere you look in the Big Apple, people are living in apartments and condos and there is no end of design shops to suit all budgets. Many folks venture out of town when sourcing materials for their homes and condos. Some drive to Montreal or Toronto, others move beyond to New York. Being away from home can provide you with a new perspective and in bigger cities there can be more varied takes on decor trends and styles. There are also a greater variety of sources, as well as shops with different furniture and accessories than you may see in your neighbours’ condos. Within Canada, Montreal and Toronto are great centres for design. That doesn’t mean there are no fantastic places to look closer to home, just simply that bigger cities offer a wider variety of styles and showrooms. Today, let’s take a look at some fun design places in New York to get ideas, many of which also sell online so you can also purchase without having to make the trip. The first is CB2. It’s a lower-priced version of Crate & Barrel that specializes in high-quality design. 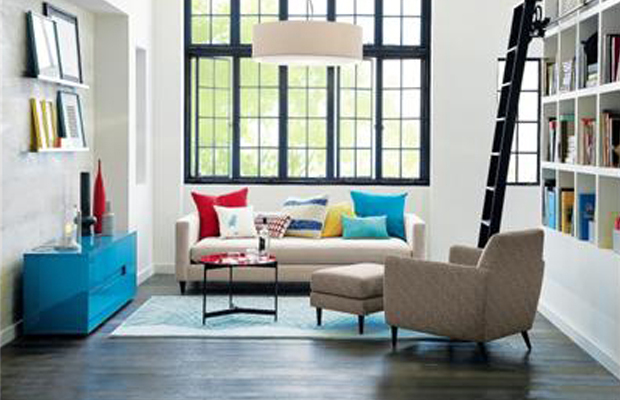 CB2 has amazingly stylish, modern furniture options, as well as gizmos and accessories. It certainly gives IKEA and its well-known furniture styles a run for their money. Luckily for us Canadians, CB2 has a store in Toronto, as well as stores throughout the United States. Furthermore, they deliver goods to Canada through their website, cb2.com. Another fantastic option, abc carpet & home (abchome.com), offers solid furniture, great lighting and accessories that range from Christmas decorations to picture frames to meditation cushions. The store, which has been a New York staple since 1897, began as a rug and carpet retailer, and now offers everything — including accessories for the kitchen sink. Housing about 350,000 square feet of retail space, this is one of the largest carpet and rug retailers in the world. Within the shop is a casual restaurant created by chef Jean-Georges and aptly called abc kitchen. Shop a little, then take a load off and enjoy a nibble at this award-winning restaurant. Looking for textiles? Zarin Fabrics (zarinfabrics.com) is a go-to. Reality TV buffs may recognize the name of this store, as it’s owned by the husband of one of The Real Housewives of New York, Jill Zarin, and is often seen on the show. The store occupies the second floor of a building in the Lower East Side and is a mecca for those searching for draperies, fabrics and upholstery. Be inspired by outdoor and indoor fabrics in a breathtaking array of colours and textures. Zagat-rated (a user reviewing system), Zarin’s is one the best fabric stores in New York. With stores across the city as well as an e-store, MoMA Store offers all that is modern, cool and hip in design. From weird, artsy gadgets to fantastic prints and ergonomic furniture, MoMA Store (moma.org) is another home-shopping must in New York. Bring some high art and humour into your life with Andy Warhol soup can mugs, coasters displaying stick-drawn representations of works by famous artists or cork coasters in the shape of pieces of toast. A few accent pieces from MoMA can upgrade your condo from shabby to chic. Travelling is a great way to inspire new ideas and creativity. A quick trip can revitalize the senses and refresh your condo’s interior. I had a lot of fun checking out these design-savvy NY stores and hope you do likewise.